Best Arabic Bridal Mehndi designs for Indian Weddings! While intricate bridal mehndi designs remain to be the preferred choice by most brides, Arabic mehndi design seem to be catching up pretty soon too! Arabic bridal mehndi design is a great choice to consider while finalising your wedding mehendi if you love floral motifs that are clean and simple. Since they are not as intricate as Indian mehndi designs, Arabic mehendi also tends to cover less skin in henna and gives a clean and minimal look. Plus, Arabic mehndi designs are easier to make because of the use of simple lines and uncluttered patterns. So, if you are one of those brides who wish to have minimal bridal mehndi on their big day, scroll down for some inspiring Arabic mehndi designs of 2018. This beautiful Pakistani mehndi design with peacock motifs, roses and Arabic mehndi patterns makes for a fantastic bridal mehndi for those who like simple and uncluttered designs. Three and five-petal flowers are the most recognisable motif of a traditional Arabic mehndi design. If you are a flower lover too, this latest henna design is a great pick for your wedding! If you are looking for minimal Arabic wedding mehndi designs, then this one with floral and delicate net motifs is something you will surely fancy! One of the simplest feet henna designs, this one has minimal motifs that cover the toes and very little part of the feet making it look modern and chic. A simple Arabic mehndi design like this one has very little patterns and fits perfectly with the contemporary bride’s style who does not want to cover her entire arms in henna. This mehndi design image perfectly captures the essence of Arabic mehndi. It has the big floral motifs and leaves along with paisley, which are the predominant motifs in an Arabic style mehndi. The thing about Arabic mehndi designs is that they are so simple and easy to draw even for beginners. So, if you are one of those brides who want to skip the big-fat mehndi and do a minimal henna for yourself, then an elegant wedding mehndi design like this one is something you should definitely consider. If floral patterns are something you would prefer to have in your wedding henna, then do save this mehndi design image as a reference for you mehndi artist. Bridesmaids can also consider getting a simple mehndi design like this, if going all out and bold is not their style. Since you will find almost all Arabic henna designs with flowers, leaves and petals, you can make a simple pattern out of all these to cover your fingers of just the wrist and back hand. This latest mehndi design for wedding is something that has absolutely taken my breath away! The stunning details of peacock feathers and neat design is total #BridalHennaGoals! 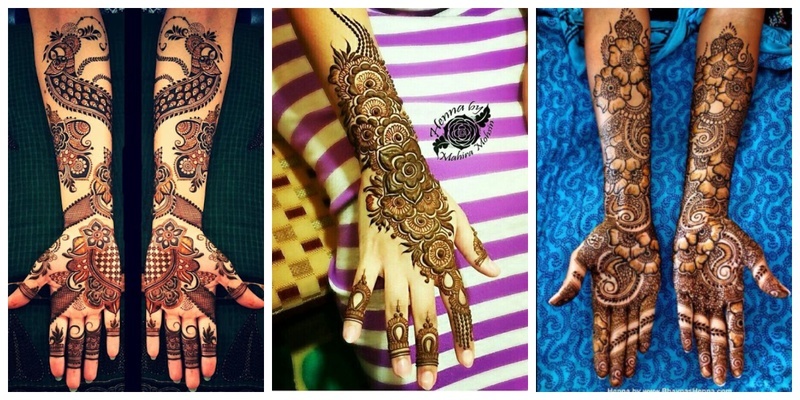 The lace glove motif has been trending in wedding henna designs like none other. It is minimal, stylish and looks modern too! This Arabic henna design is one of the more intricate ones which has flowers, leaves, nets and all sorts of beautiful motifs. The thing about wedding mehndi designs is that they need to look beautiful even if they don’t cover your entire hand in hues of maroon. This latest Arabic mehndi design does just that. It has simple patterns, which are drawn symmetrically to make it look beautiful. If you are looking for a simple henna design for your engagement or wedding, then this easy Arabic mehndi is a great pick for you! A beautiful and bold henna design, this one look lovely with big floral motifs that are eye-catching. Who said that only intricate Indian mehndi designs look bridal? Just look at these beautiful Arabic henna designs that cover the entire arm up to the elbow in beautiful flowers, vines and leaves! Gorgeous, isn’t it? Did any of these Arabic mehndi designs inspire you save them for your wedding or engagement?